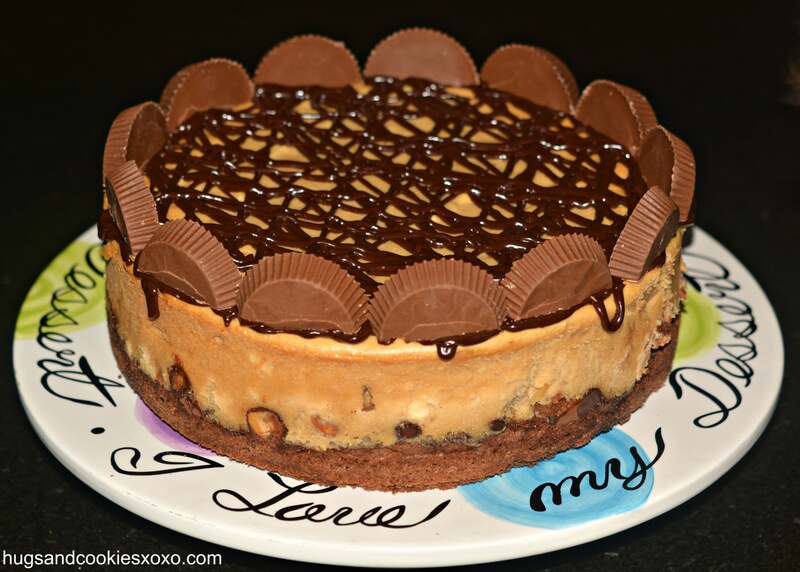 Reese’s peanut butter cup cheesecake on a brownie crust is as dreamy as it sounds. 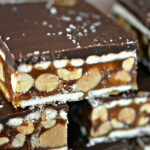 Sinful, rich, scrumptious and perfect for any occasion! Butter a 9-inch springform pan (must be about 3" tall or overflow problems! ), line with a parchment round and butter the parchment. *Note, some people had trouble with a 9inch pan so you may want to try a 10 inch but mine worked perfectly in the 9 inch and many commented it worked fine for them, too. Just a heads up! Microwave cream till hot. Add chips and let sit a minute. Whisk chips until melted and smooth. Drizzle all over the top reserving some. Use the reserved chocolate to dip the peanut butter cup halves into and stick them on the cake. Keep chilled! This is just crazy! Oh my heck. I can’t wait to make it! It must weigh about 10 pounds. Thanks for another AMAZING one! I call this Death By Peanut Butter! 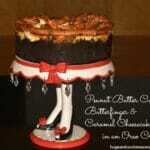 I make a 9 inch and a 4 inch cake with this recipe. YUMMY! Did you use All purpose or self rising flour? I emailed asking about the height of the pan. Mine is 3″ on the outside but only 2/5″ on the inside. Could you please measure your pan that you used and email me at tobejane@gmail.com and let me know, please? Yikes-made this over a year ago-not sure which of my pans I used-just be sure it is deep! I was going to make this cheesecake, I was wondering can you freeze it for later? I’m not sure what I did wrong; but I am very disappointed that it didn’t turn out. Well, I know the first thing I probably did wrong was not use a water bath. I did not have a roasting pan big enough to put the springform pan into. I googled the need for a water bath and decided it would be fine without it. My brownie crust got extremely hard and tough – almost like it was cooked too long – 25 minutes on it’s own and then another 90 min with the cheesecake batter??!! And, I think the 90 min for the cheesecake itself was too long. Now maybe the hot water bath would have fixed all my problems; but again, very disappointed – it’s not cheap to make this cheesecake and it takes quite a bit of time. I also had lots of cheesecake batter left; but I knew I wouldn’t use it all ahead of time after reading other reviews. I knew that my pan was less than 3 inches high. Try again but follow it exactly and hopefully it will be perfect! I have two 9″ spring form pans. However, when I measure the depth on the outside it is 3″ but if I measure it inside it is 2.5″. I need to make this for a group and I am curious as to where you measured your depth on the spring form pan? Could you email me at tobejane@gmail.com and let me know , please? oooh tough question-sorry I am not home to measure for you. The next time you try to make a cheesecake and you don’t have a pan large enough to hold your springform, try placing a pan of boiling (or extremely hot) water on the rack below the rack your cheesecake is on. Steam will still be created in your oven environment and has worked just fine, in my experience. In that case, I would def check your oven out. Good lUck! Going to try it next weekend. Yum! Your modifications look delicious and your slices are so PERFECT! What’s your secret?! Thanks for the shout out :). Awwww!! Thanks so much-a nice SHARP knife lol!!!! 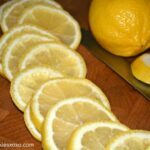 I could imagine someone butchering their cuts with this recipe. i havnt made it yet but am about to start it looks so good, im afraid its gonna be so rich i can only take a few bites tho lol anyways i hope the hot knife tip works well for you its always worked for me BUON APPETITO!!! have tried a lot of recipes and they have been delicious. My family loves them. Thank you so much. Did anyone else actually make this recipe? I closely followed the directions and was starting to get worried when I pulled the brownie part out of the oven. It was taking up about 1/2 of the 9 inch springform pan. Hummm, it must compact down. I poured the cheese cake batter over it and have several cups of cheesecake dough that will not fit in the pan! I would guess about 3 cups are still left in my mixing bowl and the pan is completely filled. I have checked and rechecked this recipe and am sure I didn’t have any mismeasurements. Are you sure you used a 9 inch pan? It is definitely a 9 inch pan but maybe your sides were not as high?? Mine must be shorter. I turned out wonderful and it cooked in the same amount of time that you suggested in your recipe, I just had a ton extra! When I was getting ingredients for the recipe I thought I was to use 2 packages of cream cheese, maybe you did the same. 2 pounds is actually 4 packages. If you hand mix your brownie batter that shouldn’t happen, the puffing. If it does again simply let it cool for a while. It will “deflate”. If it doesn’t fall enough to your liking then just press on it. You want a brownie crust, not a brownie, after all. Try again! All of your filling will fit, with just enough to lick off the sides of the bowl! Yum!!! Tracy-thanks so much and I am glad the taste testers are all happy!!! I just made it and my cheesecake pan say 10 x3. It did fir perfectly. Can’t wait to taste this tomorrow for my sons birthday. This was a hit!!! Turned out perfect. Everyone loved it. Time consuming but, totally worth it for special occasions . Ty for sharing. I did not have a 9″ pan it was just over 8, so I made 2, worked great. Just pulled them out of the over and smell delicious!!! so glad it worked out!! yum!!! Never throw away.left over batter, especially cheesecake. Pour into greaded glass bowl and.bakeit. depending on amount of leftover, 1/2 hour to 45 min. Cool on bowl and flip it over into plate. Top as normal. You do not need a crust, but if you desire one, cut up gram crackers to fit bowl, they pour cheesecake mix over it. I never throw away batter. I put it a small saladtype bowl and microwave it. even cupcakes. You can put the batter by itself in cupcake pans then when you take them out drizzle chocolate syrup over them . any batter like brownie mix, cake mix I do like I said in the microwave. you can save them even freeze them. then if you are getting company and need something quick. I keep something called junket Danish desert . I crumble up whatever I have with what ever berries I have with the glaze in between top with whipcream and you have a fancy desert. quick and easy. the junket is easy to do in the microwave also. the hardest part is deciding what you want to layer out of what you saved lol. I have even down chocolate pudding, with a layer of strawberry and a layer of whateverkind of batter I baked and saved with a layer of the junket in between and top with whiipcream anything works so when you have extray batter of anything just bake it freeze it and crumble away. I know you said it was your first time making cheesecake, but you could always put the left over batter in muffin cups with a Vanilla Wafer as the “crust” and bake them to have bite size cheesecakes. I make them at Christmas time and they are a huge hit! you have to use small muffin cups, because of the wafer. I am making this cheesecake for the second time. The first time I made it I used 4 packages of cream cheese just like the recipe called for and found that I had a ton left over. I froze what was left and will make another one sometime. 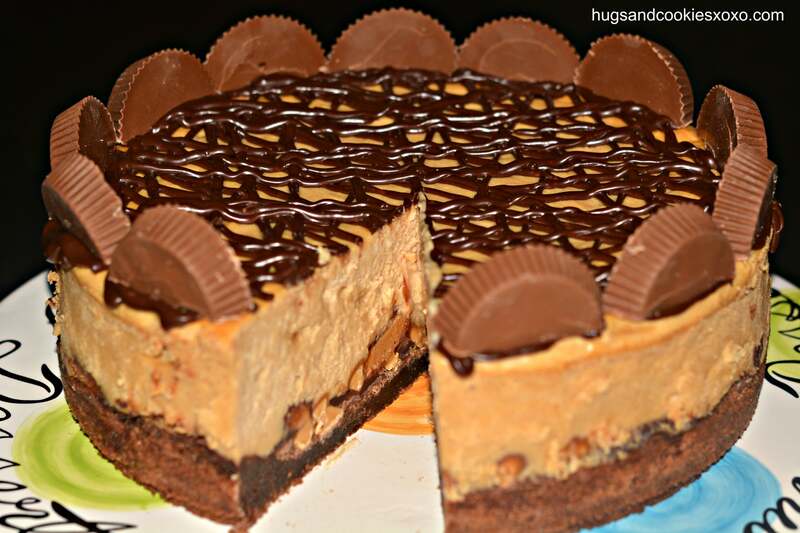 Tonight I modified my recipe to make just a chocolate cheese cake with the same recipe minus all of the peanut butter. I also only used two packages of cream cheese. This seemed to work well. I did not have any batter left. Maybe just a suggestion. I am hoping that it also will allow the cheesecake to be a little lighter and not so thick. I made this cheesecake to take to a cookout last weekend, it was soo soo sooooo good, very rich and creamy. However, in the making and baking process I too had much batter left over and the brownie did seem to be puffed but I think it was just too much brownie batter for a 9-inch pan. And, I did have alot of the cream cheese batter left over. Next time I think I will use the 10-inch pan and see what happens. I was very disappointed that I had to throw out so much batter. There wasn’t enough to make another cake and wayyyy too much to have to toss. Oh well, we learn by our mistakes…well, I don’t believe I made a mistake. I think the recipe calls for a smaller pan that what’s needed. Anyhow, the cake was wonderful and turned out even prettier. Most of the quests thought for sure I purchased it at the grocery store because I did buy a tall clean plastic cake container to carry it in as I didn’t have any cake dish or serving plate with a lid tall enough to put the cake on. Good luch to all of you who make this cheesecake, as I said, it is simply delicious. P.S. Thank you for sharing this amazing recipe! Meredith-I am so happy you loved it!!! The same thing happened to me the first time I made it, so made a graham cracker crust for the left over. Just made it again today, but I bought a 10 inch springform pan. Worked fine! I absolutely LOVE this recipe as foes my family. Taking it to work Saturday! I made this recipe exactly as instructed I think it should’ve been 2 pkg of cream cheese instead of 2 lbs. had way too much batter it took forever to cook. Sorry yours took so long to cook. I am not sure why but the measurements are correct. Hope it was still yummy once it did cook! I have made this recipe numerous times and the original does say you will have left over batter following there pan suggestions. I use a 10 inch pan and adjust cooking time accordingly and it turns out awesome every time. In my opinion, the water bath is always a good idea for any cheesecake, but as far as the fudge brownie bottom…i bake it less than the recipe calls for..abot half the time. The original mentions that you need the exact size pan or you may have to reduce the filling. They were able to fit it all. Re adjusting the cooking time accordingly for a 10″ pan – how long do you cook it for? Just finished by first one…. made it for a surprise for a friend that is crazy (like most of us) for choc & peanut butter anything I hope they likes it!!!! It looks like the picture hopefully it taste as good. Mine pan is plenty high, still had loads extra. The cheesecake has puffed up enormously and cracked, still jiggly in the middle though. Probably another Pinterest Fail. So strange-mine was about 3 inches tall and fit perfectly. Not a fail…you just mixed it too much. Was your cream cheese room temp?, that makes it easier to mix. The thing with any cheesecake is that you need to keep air out of the batter…don’t mix on a high setting or vigorously. Low and slow for cheesecake. Try again…it is so worth it! I made it and I had a 3 inch tall pan as well and it turned out perfect! I just made this, and mine did not come out watery at all. It may be helpful to whisk the eggs seperately and then add slowly to cheesecake batter. -After it’s done baking, let it cool in the oven for about an hour. GLAD IT WORKED OUT FOR YOU, TOO! ENJOY-IT’S DEEEEEEELISH!!!!! laws are all very happy to be taste testers! Thanks-Thanks and Thanks! My house smells wonderful! Unfortunately I already said I was going to bring it….sad day here…it could have stayed with me!!! Hi, just made this tonight. I used a 10in pan and everything fit wonderfully, I couldn’t find any higher pans and 9 just looked too small. My batter wasn’t as thick and the pic looks, more like a cake batter. It has been in the oven now for 2 hours and is still pretty jiggly in the middle, though the edges seem firmer. Knife test definitely still dough inside. Will try a second attempt tomorrow, appreciate any pointers. (This is my first cheesecake ever). Maybe some batter is turning out like cake batter because it was whipped too much? Also, the cheesecake should be jiggly and 2 hrs is probably a bit too long I think— 90 minutes was all mine took. And sticking a knife in there may cause cracks. Mine came out perfectly as I followed the recipe to a T, baked for exactly 90 minutes, then I turned the oven off and opened the door and let it sit there for about a half hour. I then took it out and set it to cool for another half hour. Then I put it in the refrigerator and it sat in there for about 8 hours. Then I took it out of the springform pan, and did the topping. Now I just need to eat it later! CAN’T WAIT FOR YOU TO TRY IT!!!!! It was very yummy! Only thing was the crust got very hard, thinking it was the chocolate chips that solidified. But it was very very good other wise! Is it really 2 pounds of cream cheese? Because that would be 4 blocks of cream cheese! That might be why people are having extra filling. One block of cream cheese is 8 oz or 1/2 a pound. Just want to make sure before I try to make this. Wondering if this would work on a smaller scale… like in individual serving muffin tins or something of that sort??? Any thoughts? I had about half of the batter left over, so I turned that into mini cheesecakes using my cupcake tin, and a Reese’s peanut butter chips ahoy for the “crust”. Baked them at 350 for 25 min. They are setting up in my fridge now, but they definitely look delish. I just made this (w my mothers help Bc I was finishing my 2yr old bday cake while nursing my 1 month old) for my husbands bday today, turned out great ! I think we might have put too much water in the bottom of the pan Bc the brownie crust was a little soggy at the edge. I also added mini Reese’s pieces to the cheesecake part. Husband & family loved it ! Very rich & large ! They needed extra big glasses of milk Bc it was so creamy ! Thanks for the recipe !! Was beautiful ! SO glad it worked for you too-and all the batter fit? Some people have had trouble fitting it all and I am not sure why sine mine fit perfectly. Happy bday to your hubby and your 2 year old! Just made this today and everything came out perfect. It’s in the fridge now I haven’t put the top on yet ill have to do it in the morning. I just wanted to say that I followed the recipe exactly and had no leftover batter and it was perfectly cooked at 90 min. I’m not sure why others had any issues with cracking…maybe it’s an oven issue? I used a mixer with mine too and really blended everything. My pan was 3 in. high but I still had plenty of room left over after the batter was all in there. Oh well. Anyway I can’t wait to try it! I’m happy so many people like my recipe. I originally created the cheesecake in 2007 for a contest. I sort of regret putting it on Tasty Kitchen because now so many people are pretending it’s their own. I’m glad I don’t do this for a living. You put a link to Christine’s site, but she is not the creator of the recipe. Thanks-I will credit it to you-I just gave credit from where I found it from but happy to give credit to you as the creator! Made this yesterday. Didn’t think the batter would fit on top of the brownie crust but it did and it came out exactly like the picture! YUMMY!!!! Question? Dark brown sugar or light brown sugar? Can the amount of brown sugar be cut back? I just made a pumpkin cheesecake that called for 1 cup of brown sugar and it was so sweet I could not eat it. You’re making a foil cup to keep the water out. Trick I found in a recipe a while back, instead of a water bath, put the pan of water on the rack under the cheesecake, still get the benefits of the even cooking without risking your cheesecake. Awesome! Except my brownie was dry, how do I fix that? sounds like u r on your way to perfection! SO GLAD YOURS FIT!!! I guess some 9 inch pans have lower sides-I will add the 3 inches to the directions-thanks for that. Bet it will taste awesome even w/o the water bath! I see it is ALREADY in the directions!! lol!!! Maybe some are not measuring first? Thank you!! My hubby is going to love this! Just finished making this! II had been reading the comments regarding the batter not fitting. I was a little apprehensive because there is a lot of batter, however after the crust was done baking I removed it and let it settle for about 10 minutes. I added the mixture on top, then used a spoon to flatten it down. This gave me a little extra room! The batter fit PERFECTLY. I used a regular 9 inch springform pan. Hope this helps because it looks AMAZING. So glad it was a success for you, too!!!!!!! Made this for my friend’s birthday today and it was a hit! I used a 9 inch springform pan and it was perfect. Everyone thought it came from a bakery..
Danielle, thank you for this recipe, it was delicious!! I made this over the weekend and it fit my 9″ springform pan with no problem (my batter was more like cake batter so I held my breath). This was the first cheesecake I’ve ever made that didn’t crack! I made this for my office barbeque, followed all of your directions and, like so many others have said, people thought I bought this at a bakery. It was gone in a fraction of the time it took to make it! Thank you again for this awesome cake!! Help! I am making this tomorrow and want to know if baking it in the water bath is necessary for this recipe? Usually when I bake cheesecakes I put a 9 x 13 pan mostly full of water on the shelf below (to avoid cracks) and the cheesecakes come out great. I wasn’t sure if the water bath in this is for the same reason (to avoid cracking) or if it actually needs to bake in it that way. Since this is certainly not a cheap cheesecake to make, I’m REALLY hoping it works! Also, it looks amazing and I can’t wait to eat it! I have only made it as written. I say follow the recipe to a T! Good luck!!! It all worked out beautifully! I got over my fear of doing the water bath (I’m just always afraid water will somehow get in!) and followed everything to the T and it came out wonderful! 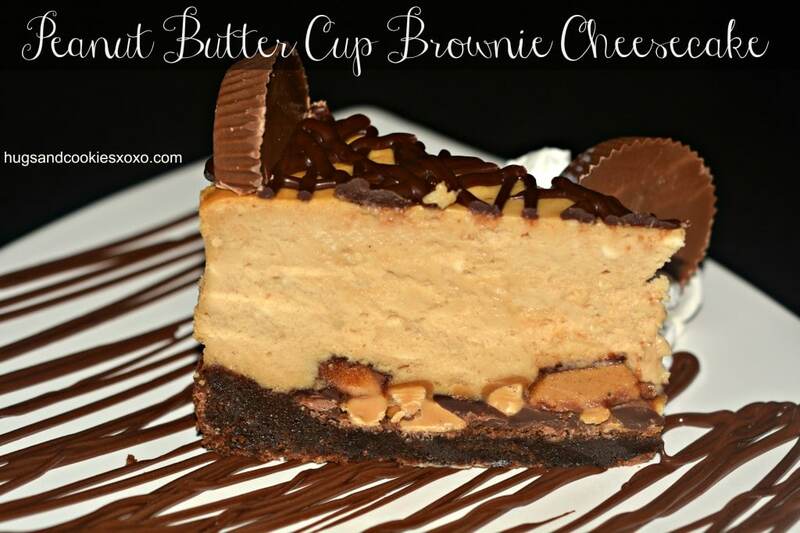 I used the entire brownie batter for the crust (we really like brownies…) and then smushed the chocolate/peanut butter chips and chopped up peanut butter cups down a bit into the cooked brownie to make more room for the cheesecake batter. 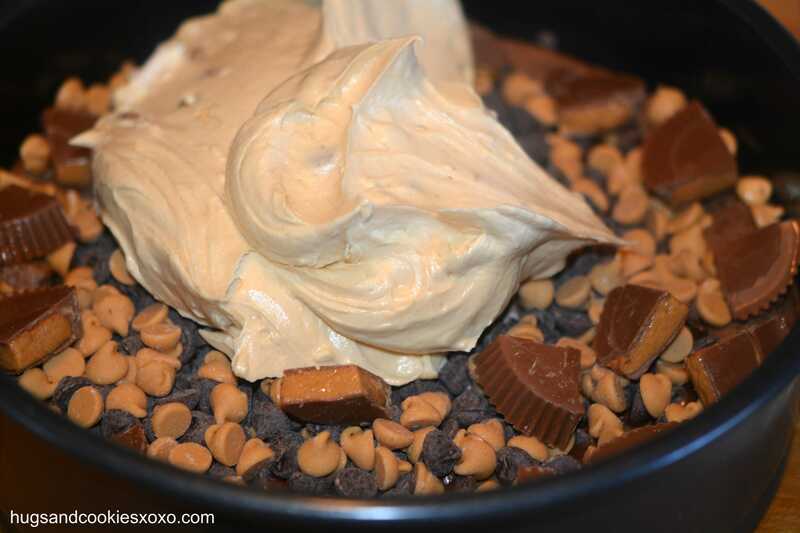 I still had a bit too much batter, but that was fine with me and the hubby because we just baked that off separately with some chocolate & peanut butter chips and chopped up peanut butter cups on top and ended up with extra! Decorating was a lot easier than I was anticipating and it looked just like your photos! (I wanted to share photos of mine but can’t figure out how to do it on here). 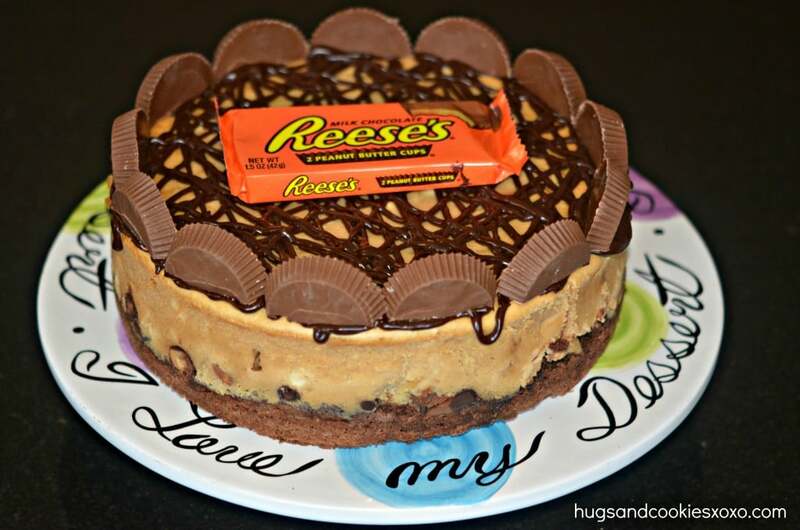 I actually made this and another variation of peanut butter cup brownie bottom cheesecake today, and sliced them up to make a sampler platter to take to a birthday celebration tonight. So we were able to taste test. I think this is the best cheesecake I’ve ever had and my husband gave it a 10! Yum yum! After baking for 90 minutes, recipe states to cool for 1 hour. Is this in the oven (with door cracked or closed) or on a wire rack outside of the oven? Also is the cake left in the water bath pan to cool for the hour or removed to cool? At what point in the process is the cake removed from the springform pan? Is it removed after the initial cooling time or after the chilling time? Looks amazing and I don’t want to mess up!!!! Just cool on the counter. I remove springform after it chills. Does it cool in or out of the water bath? Cool it out of bath removing it carefully. Hi is it possible to freeze this cake? Thanks can’t wait to try it……. HI DOTTIE! Hmm, I have never tried. I have frozen it before but cut into slices 1st so I could just get a piece out of the freezer at a time..still as delicious as it was the day I got it. My first attempt the only issue I had was getting the pan to come off cleanly when I released the sides. I have since made this cheesecake two other times and each time I make it I seem to get better results. Making it again tomorrow as a birthday present request. Keeping my fingers crossed each time I make it. I am always in fear it won’t come out of the pan……It’s an amazing Cheesecake….. I just wanted to say that I made this for my father’s birthday and it turned out beautiful and delicious. I agree that you do need a 10in springform pan, but I used the leftover batter and made cheesecake cupcakes and drizzled them with my leftover ganache and some of peanut butter and chocolate chips :-)! Just found this recipes and want to try this week. When you let cool do you take out of the oven right away? My grandmothers recipe has me open door and turn oven off for hour then take out and cool on counter for 30 min. So im used to that. What way do you go with? Danielle, 2 pks of Cream Cheese or is it 4 pks.I sure don’t want to mess this up because it’s a expensive cake to make but looks well worth the price.Thanks. It is 2 pounds, which is 4 8-ounce packages. How much unsweetened cocoa do you use? The recipe has a ? In that place. Thanks! 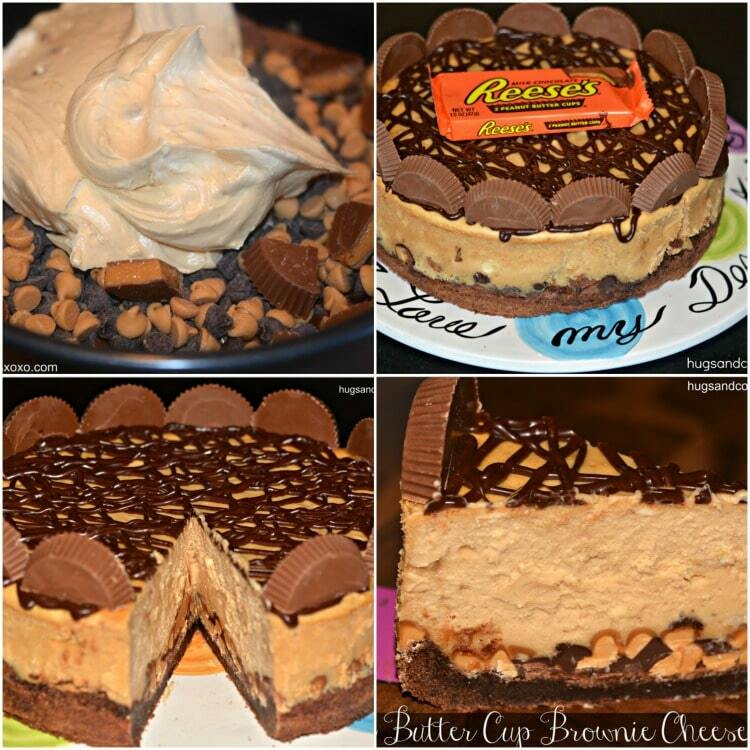 Are the peanut butter and chocolate chips suppose to be hard after baking the cheesecake? Otherwise it turned out great! I just made 2 of these. I had zero problems. I did one 10″ and one 9″…amazing. I’m sure they weigh 10 lbs…lol. Im so excited to eat this tomorrow!!! So glas to hear it worked out well like mine!!! Yay!!! Adding eggs should be the last thing you do. Have made this many times now. Eggs last on low. Awesome recipe! I just made this tonight. It is cooling right now! Followed directions to the tee and had no problems. I used a 9″ pan. I am confident it will taste as good as it looks! No cracking either! This was soooooo good! Got so many compliments on it, will definitely make it again! I can not wait to cook this!!! My husbands eyes bugged out when I showed him the pictures. I have cooked a cheesecake crust before as this as been described and cooked for 25 min before putting it back in the oven to bake the cheesecake and the crust came out rock hard. Is the going to come out the same way or will it come out nice and soft? I don’t want to ruin such a beautifully designed cheesecake. This is not a hard crust. i can’t buy peanut butter chips here in the UK,what’s the best next thing to use as an alternative please? I made this today with our daughter for her daddy’s birthday. Our daughter has down syndrom and this was simple enough to do that she could help with every step and did the mixing just about all by herself (she’s 6 and is always helping in the kitchen) we had so much fun thank you for sharing this. I’m 15 years old, and this is my first time ever making a cheesecake, however I have a lot of experience baking. This dessert is mind blowing. It is perfect for a big family get together, because it is so sweet you can only eat a little bit! This cheesecake, by far is the best cheesecake I have ever eaten. When I have my own bakery one day, this WILL be on the menu!! 🙂 Thanks SO much for sharing! What a nice message! 15? I am so impressed-hope I get an invite to the bakery!!!! I just put mine in the oven. I used a 9 inch pan and it fit perfectly with about a 1\2 inch left at the top! I’ve made plenty of cheesecakes before that my family loved, but I’ve never made it where you put it in water in the oven. How important is that? Why would I need to do that versus just sticking it in the oven? Wears the difference.. I ALWAYS bake mine in a water bath! I have found that it helps them from splitting! Also, another trick, when the bake time is up, turn off the oven and leave the cheesecake in there to cook down with the oven, also helps it from cracking! Has anyone made or knows how to make this cake vegan style? It looks delicious and I might use it for my dad’s 50th birthday. awesome-happy 50th to your dad! At what point do you take the cheesecake out of the pan? I made this cake and it was a hit! BUT the brownie crust was very very hard and difficult to cut. Do you know what I did wrong?? I have a request to make it for a friend, but I want the brownie to be easier to cut and serve. Hmm, I am not sure unless it was cooked a few mins too long? Concerned to try this as the average brownie bakes for 25 minutes… can’t imagine how hard and dry it would be after baking for a total of almost 2 hours!!! I have 12 kids and their better halves and 30 grandkids. I have been baking a lot for a long time. We all loved this cheesecake. Following the recipe to the letter I did have batter left over using a 9 in pan. I got a very nice 4in cheesecake from the leftover batter. I decorated it to bring to an aunt who was recovering in the hospital and couldn’t be with us. The crust was a bit hard but I think it was somewhat due to how very cold it was. It was better after it sat out of the refrigerator for a bit. It was easily cut with a piece of fishing line. We have no fishermen but I bought a roll of fishing line for a $ to keep in my kitchen. I will use a 10 in springform pan and make this many more times. 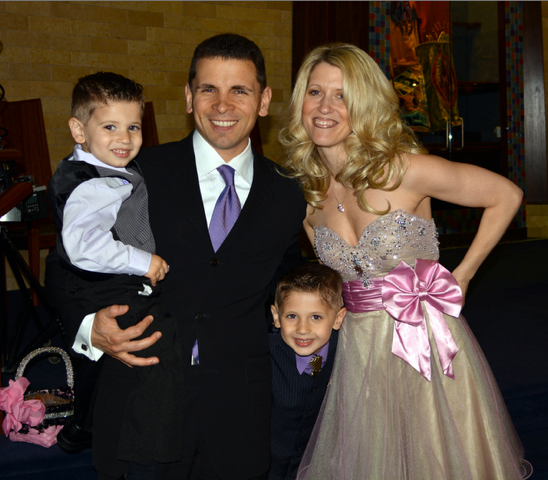 With a family the size of ours a little bit bigger is a plus. Love this recipe! Just made it for the second time! The only thing I don’t like, is how dark the top of the cheesecake turns out. I am assuming it is because of the peanut butter and the brown sugar, but it looks “burnt” almost. Just had to share that my daughter made this tonight for our annual cake auction fundraiser for the Boy Scouts. It turned out beautiful and tasted amazing. It is sooooo rich! We did not have a problem with extra batter and we also put the pan of water on the rack below the cheesecake instead of making a water bath. That was a trick I learned a few years ago and shared with her. Anyway, another friend of ours also brought the same cheesecake, so your recipe is popular here 🙂 The cheesecakes sold for $100 and $115 and so many people commented on how yummy they looked. How funny that someone else made it too!!! do you think you could use a 9×13 pan? I can’t believe I forgot to add the vanilla to the cheesecake mixture. I pray it comes out good! U prob won’t even taste the difference! No worries! Made this on Easter/for my dad’s birthday! Everyone LOVED IT! Thanks for the fabulous recipe! Will be using your site again! So glad it was a success!!! I love this recipe and have made it a few times (went over great at work Christmas party) . 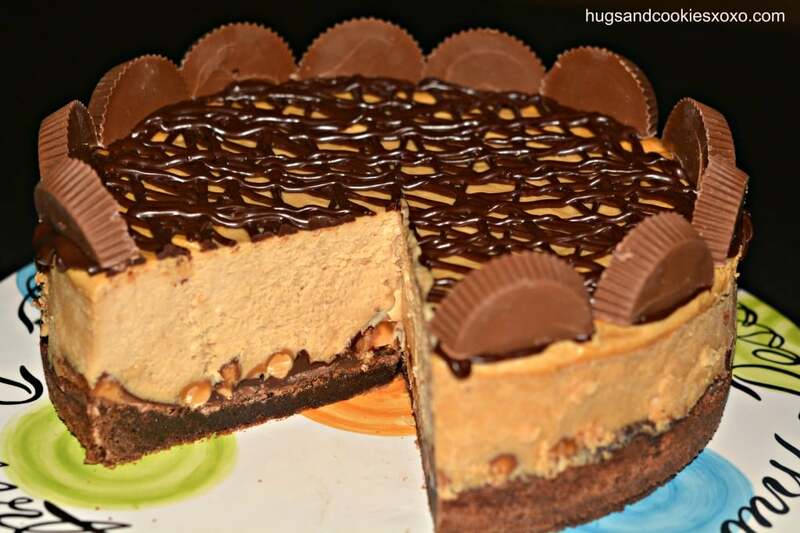 The only problem that I have found is the candy layer between the crust and cheesecake is too thick, making it very difficult to cut without destroying the cheesecake. Im making one monday for another party and am going to cut that part down a bit and see how it work…Does anyone know if this recipe would work for individual (say cupcake size) and if so how it would alter the cooking time? Just made this for the first time. I’ve not eaten an actual piece but I cleaned the forms and this is simply fabulous. I made an 8inch round and a 4 inch and it was perfect. The 8″ is for a birthday party today. My husband has my daughter out of town so I intend to freeze the 4″ for him for father’s day. The only change I made was to the drizzle. 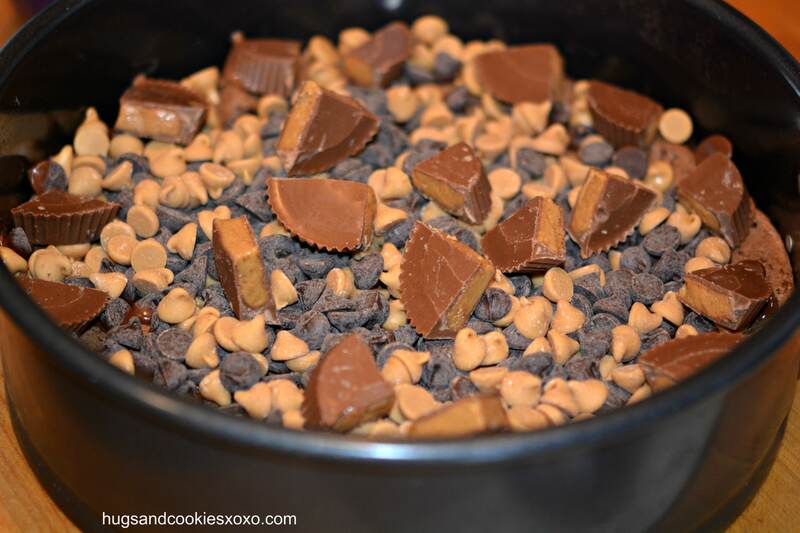 I mixed 3/4 cup chocolate chips and 1/4 cup peanut chips. There was so much drizzle and it tasted so good with the form left overs that I ended up covering the top of the cake with a chocolate layer. Not sure how it will cut but I know it will taste heavenly. I used my oven on convection and my top was not at all overly browned. It was absolutely perfect! Thank you for the recipe. I did put the recipe into my fitness pal to keep myself from over indulging. OMG. forgot the vanilla and only put 1 lb of cream cheese, what is wrong with my head. OMG I just took this out of the oven and realized i forgot the vanilla and I only put 1 pound of cream cheese instead of 2. Rookie mistake. Hope it still turns out good. Do you put the toppings on after the 1 hour cool time or after the 4 hour fridge time? 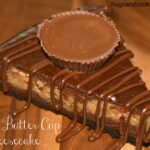 can this be made in a 9″x13″ pan and if so would i change the recipe in anyway? Just curious, does anyone know how many calories in a serving? This recipe is so easy to make. Cheesecake turned out perfectly, no left over batter. It’s in the fridge now. Can’t wait to eat it tomorrow. Cheesecake was a hit! Everyone loved it, a definate make again!! Was so excited to make this recipe…. we had leftover batter (which was liquid) and put it in a small ramekin and baked it for the same amount of time as the 9inch cake. We took it out after 1.5 hours and cut it open (the small one) and the texture was all gooey and greasy… it was only after looking at the comments that we realized that 2 pounds of cream cheese = 4 packages, not 2!!! So we have a feeling it’s not going to turn out well……. Cream cheese is always measured in pounds because package sizes can vary greatly. I am also wondering if I should use 3 cream cheese, based on so many comments if having too much batter leftover? Or should I just plan to make the cheesecake AND muffin sizes? And I have one more question about the waterbath, (I have never made or watched cheesecake be made) how do you keep the water from seeping into the crust when using a spring form pan? Help!! I’ve made this numerous of times and today was my first FAIL. EPIC FAIL. It literally didn’t set at all the the cheesecake went everywhere. The brownie crust and the peanut butter chips, chic chips and reese cups still look fine, can i reuse the crust/toppings or should i start over? I’m thinking something must be off with my timer as the chips didn’t even melt. I would def check your timer and oven. Good luck! I would def check your oven then. I used a 10 inch spring form pan, I also used a peanut butter cookie for the crust instead of the brownie. This cheesecake was a hit at my job. It turned out perfect. I will definitely add this to my favorite recipes. This was soooooo good, creamy and rich!!! woo hoo! I love success stories! I have mine in the oven now and it only has about ten min left. I too had to use a 10 in pan and the middle still seems really liquidy underneath Is that normal or should I leave it in longer? I’m going to attempt this recipe for my fellas birthday tomorrow, was the heavy cream just heavy whipping cream? I made this several times, and find the chocolate chip and peanut butter chips layer is hard to cut through. .. why is this? Other than that…. it has been a hit at our Easter Dinners. Hmmm, not sure-r u cutting it after chilling it? Would like to make this a few days before dinner party and was wondering if it can be frozen? I am sure it would freeze well. I made this for my son’s birthday. My family can’t stop eating it. Every time they have another piece they say this is incredible. I used a box brownie mix and put 2 cups in the bottom of the 9in pan. The cake batter filled almost the entire pan. I had about a cup too much batter. 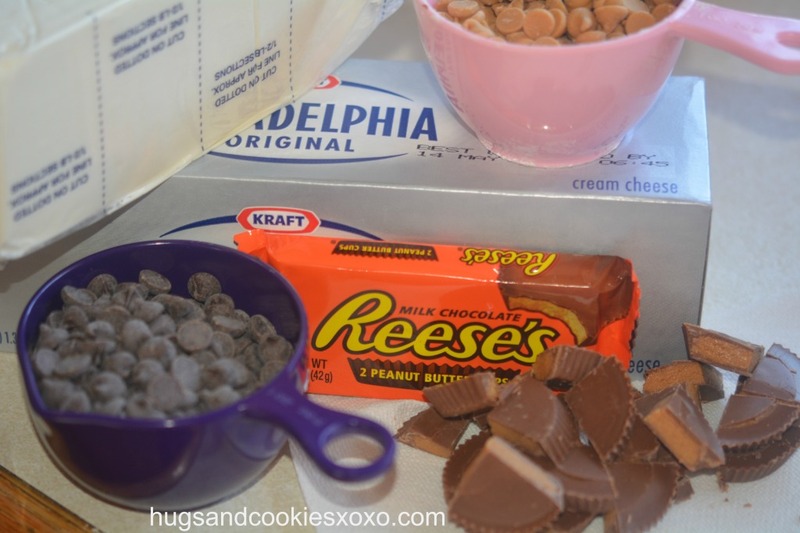 I skipped the peanut butter chips but put in more cut up reeses. Next time I would put less batter in the pan and have another pan ready. Yay-glad they r enjoying it! Happy birthday to your son! My husband wants to know if there are other recipes. He’s thinking pumpkin. Don’t know if you can help me. type pumpkin in the search bar on the right-lots of pumpkin recipes!! Can a store bought brownie mix be used instead? I don’t see why not. Go 4 it! It shouldn’t wiggle too much-just a little!! Is it okay if it cools longer than an hour? OMG!!!! Making this for my sweeties birthday he is a big Reese cup addict. He’s gonna love this! I’m very disappointed because I spent a lot of money on the ingredients and then forgot to put my heavy cream in my batter! Plus, the water leaked in and ruined my crust! I am trying this recipe today and remember a trick I saw on the Pioneer Woman …wrap the bottom of your springform pan with aluminum foil- up the sides too a few inches to protect water from seeping in. I made this for Christmas and it was a hit! I used a 10 inch springform pan and a water bath and I let it sit in the oven for 4 hours after it was cooked like I do with my regular New York Cheesecake. It was really rich but good! Is it ok to use a boxed brownie mix for the crust? I dont see why not-but size may be different. 1) Do you wrap only the sides of the pan with foil, or around the bottom and up the sides? 2) I’ve read a couple of comments that seem to suggest the brownie crust should go up the sides of the pan by somehow pressing it down? I’m a little confused as to the instructions for putting the brownie in the pan so as to avoid “puffing,” etc. Yes, wrap the bottom and up the sides! I made this for a friend’s son bday and their response was it was too rich!!! I followed the recipe exactly as is!!! My kids on the other hand love it!!!! What should I do to kill some of the richness?? My mouth is watering this looks so yummy! Do you just put parchment paper over the bottom of the pan, or up the sides to? I’ve made several cheesecakes but thus part is new to me. It was very good. Brownie was a little too hard but I didn’t let it sit out for long enough because we had to try it. 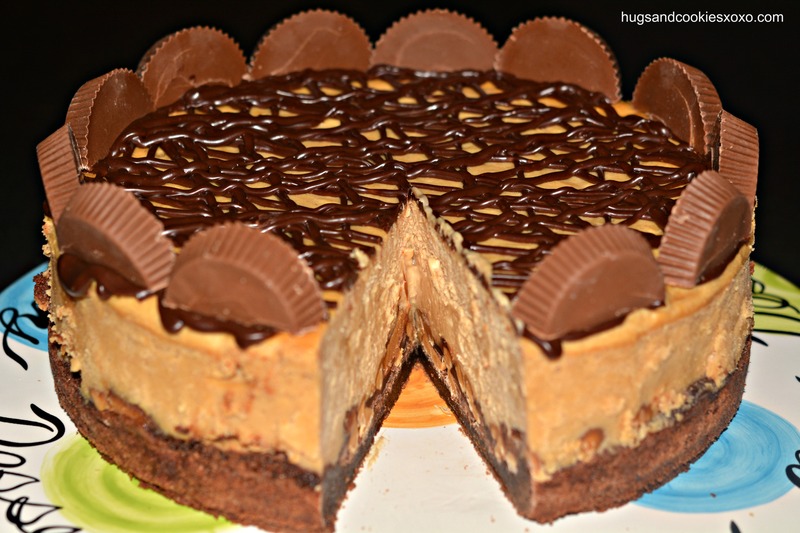 If you like peanut butter you will love this cheesecake but it is really rich. As someone else posted….death by peanut butter is a great name! oooops. how much sugar do you put in the crust? I put 1 and 1/4 cup of sugar. Was it only supposed to be 1/4? if so how bad will this mess up the cake, I just sold it to a co-worker. you were right!!! was it good? Whew, it turned out great. keep up the good work. how much sugar do you put in the brownie crust? Do you have a high altitude variations? Anna, I’m at high altitude and made the following adjustments to this recipe: use a 10″ springform pan, preferably at least 3″ deep. Even so, I still had to use heavy foil folded double to increase the height of the pan sides (it grows very tall here) and to prevent overbrowning. For the brownie base, I upped the flour to 1 1/4 c., reduced the sugar by 3 Tbsp, did a scant 1/2 tsp baking powder and salt, and tossed another egg in it. It wouldn’t hurt to put a bit of water in it, but my boys like the crust a bit crunchy. Otherwise, I followed the directions exactly (the water bath is absolutely necessary) and it came out perfect every time. The only downside is that it is so rich I can only eat two bites, but the young adult sons kill it and die happily. Just made this cheesecake in a 10 inch pan (my 9 inch is too short) and it turned out perfect! I baked the brownie bottom for 15 minutes because of the change in pan size. My cheesecake batter was a great consistency and fit perfectly. Haven’t tried it yet, I made it for my dad’s birthday tomorrow, but it looks delicious! OMG this is my favorite recipe! I made this a couple times and now i have to make it for a mardi gra dinner we are having! I hope everyone enjoys it! I made this for a silent auction dessert dash. It made top dollar. Someone paid $2000 for this glorious dessert! They said it was worth it! Hello! I have made this several times and it is delicious! 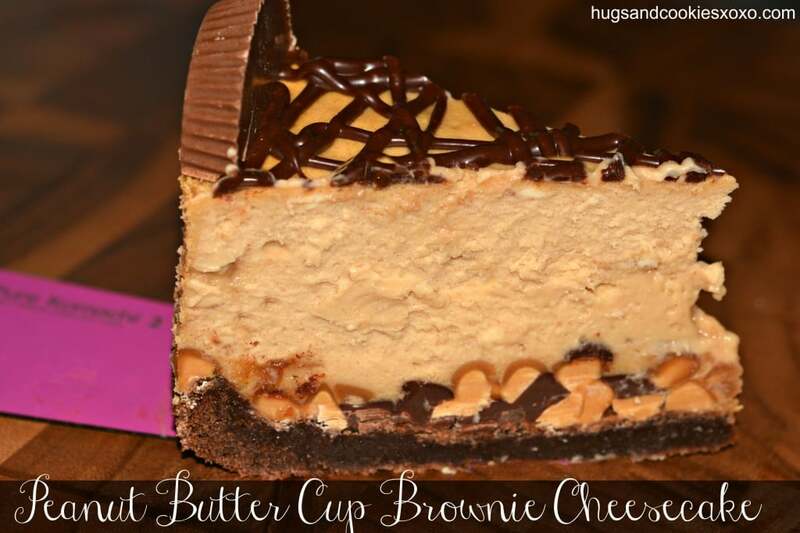 I am wondering if it can be made without the brownie crust? 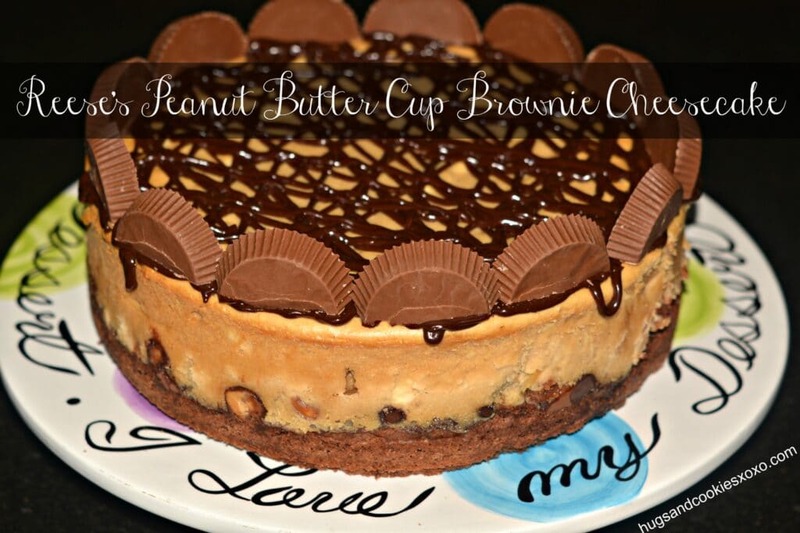 I have someone that loves peanut butter but not brownies I would like to make this for. Thoughts?